First, I want to say that Ms. Martin is one of my favorite authors and I've read most of her books. Interesting characters and family. I liked the story but torn because of the controlling attitude and demeanor of Ramsey. Ramsey was a little too controlling for my comfort. I understood their background. There is a difference between being concerned and protective for your well-being and the controlling manner in which Ramsey exhibited, wanting knowledge of Gianna's where abouts daily to the minute. Quite smothering. Although I admired his concern for Gianna, but he acted more like her father at times rather than her spouse. I do love the fact that Ramsey truly loved his wife and vice versa. Glad his overbearing behavior didn't back fire on him and their marriage. That's how love rolls! Ramsey possesses such a pure love for his soulmate and wife Gianna, that at times, it appears overbearing and stifling, the sign of an unselfish love, makes you realize compromise is absolutely necessary. As Ramsey evolves, his compromising skills expand, making his wife comfortable with idea of establishing a relationship with her absentee mother. Pregnant with their first child, excitement and anticipation have this couple, along with friends and family in celebration mode, giving time for reflecting in each characters life. I've read the Baked in Love series, was glad to get more insight through this book, however, I'd really like for Felecity and Regal to explore an indepth chemistry, after all, that's got to be the reason for the "in your face" banter. What was this? 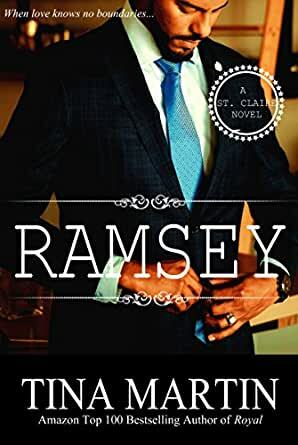 After reading Baked with Love series and Royal's story, this one (Ramsey) was a pure disappointment. It had no substance and definitely not a strong story line. What happened with the reconciliation of Geraldine and her girls? Did it happen or not? I was highly disappointed and will definitely think long and hard about purchasing/reading another one of her books. 5.0 out of 5 starsMy heart couldn’t take it! This book was so good! My heart was all over the place. I so love Gianna and Ramsey. Their love is so pure and unadulterated. I love that she and Gemma are giving Geraldine another chance. I hope she deserves it. Now I need my book on Romulus ASAP! He has Siderra twisted if he thinks she is going to just sit around and wait on him and I can’t wait to read about it!